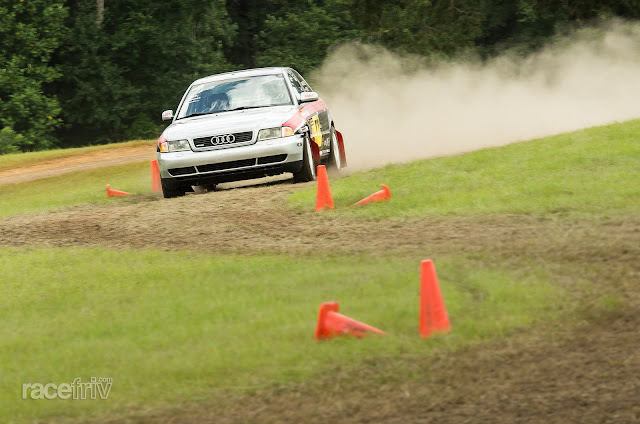 racefriv.com: Now for Something Different - Rallycross! Now for Something Different - Rallycross! Every now and then we mention our tame racing driver Christian, sometimes we even let him post an article on here. Christian is an avid autocrosser as well as SCCA member, corner worker and occasional instructor. 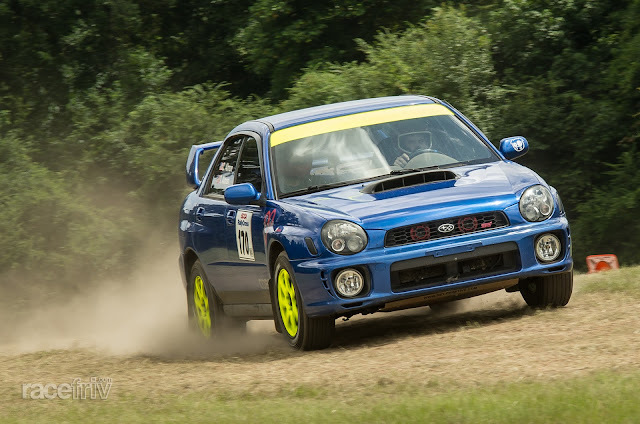 We've been bugging him for years about how there is no rallycross program in Georgia, and each time he assures us that Atlanta and middle Georgia SCCA are trying their best to make it happen. This past weekend, for the first time we got to play in the dirt, it was awesome, we want more, and If we don't get any more we're going to start killing the hostages. Hit the jump to find out just how awesome it was. As usual for any grassroots event the day started early with coffee and Mcdonalds breakfast menu items. We headed out to Milledgeville G.A. 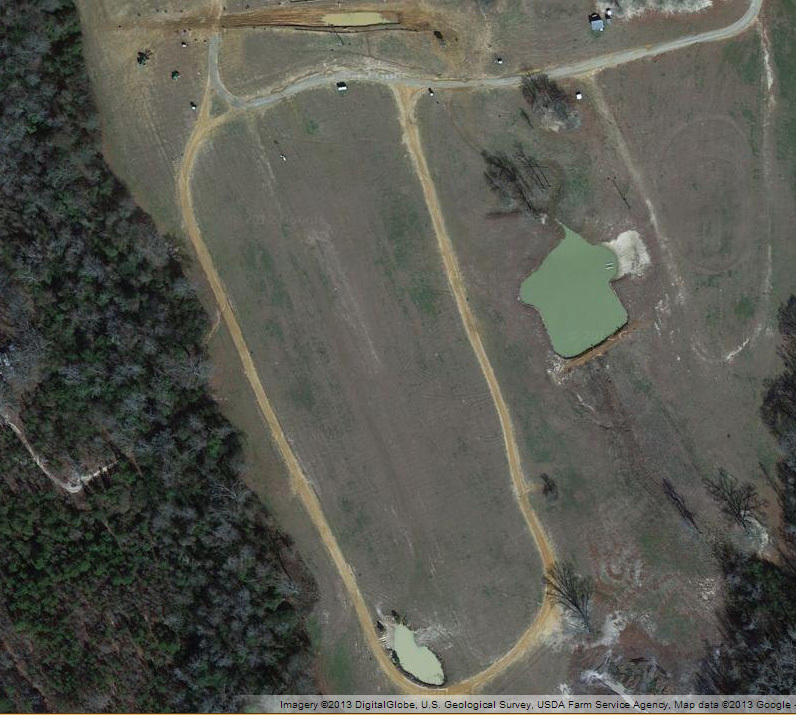 to the Thunder Rally facility about 2 hours from racefriv HQ. Middle Georgia SCCA hosted the event with the land owners and were already putting cones out when we got there. The area we had to drive on was smooth grass and still wet from dew and the previous nights showers. Turnout was great as expected with most drivers pre-registered and already sorted into classes. All told we had 29 entrants and total cost for each driver was $30, those are some seriously cheap thrills! That field in the middle was the area we raced in, about 300 feet across by 1000 feet long. The drivers meeting explained we had 2 run groups, each group would get 4 runs in the morning, a break for lunch and then 4 more runs in the afternoon on a slightly different layout. We all got to walk the course and then drive a parade lap as well. Christians Mitsubishi project just wasn't ready - he can explain more himself in his build thread - so I let him drive my WRX with me. I was in AWD prepared because I had exhaust mods and a tune. Stock classes were slightly more popular and FWD stock was the biggest class. We had the pleasure of bring in the first run group and I was already in the drivers seat so I took the first crack. What followed was about a minute of sheer unbridled joy. I'd waited a long time to take my car somewhere and drive like this and it was perfect! Needless to say never having done any competitive driving before I wasn't really... ahem.. competitive, I wasn't bothered at all. Driving on grass was similar to gravel on my local back roads and so I at least had some concept of how to induce some oversteer. The lap felt like a blur of sideways action, but I do remember at one point Christian giving me a little instruction, like "un-steering" the wheel when sliding wide to get the front tires to grip again. I think he may have helped peel my white knuckles off the wheel when we got done so he could have a go too. 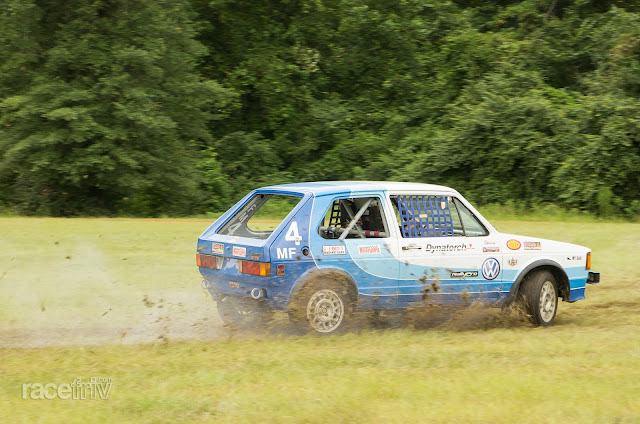 This Mk1 Golf GTi tore up the track in our run group. 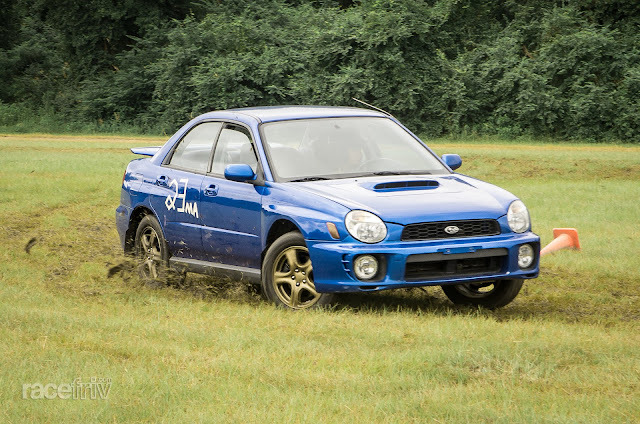 His rally tires quickly made a racing line visible in the dirt for others to follow. He worked his way down to a couple of solid 54 second runs by the end of the morning session as the only FWD Modified car at the event. Fastest AWD Modified driver was Chris Almon and his 2002 Sti Swapped WRX. he recently installed a hydraulic E-brake and had Hankook gravel tires on the car. He consistently lapped the morning course in the 52-53 second range right off the bat. Eric Lassiter and Gabriel Denes Shared this Audi A4 which completes the AWD modified class. this car sounded great and was echoing off the trees. 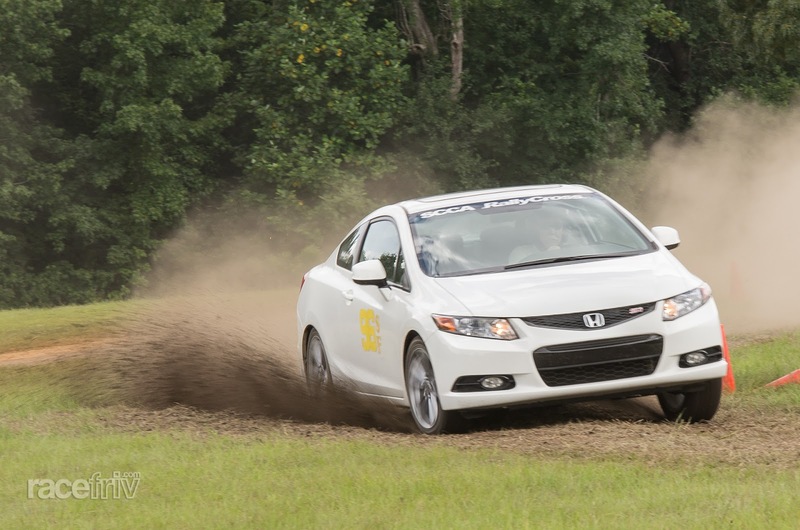 With that said the fastest total time of the day came from Ron Foley in this 2012 Civic Si, proving that driving prowess trumps AWD, rally tires and fancy gadgets. His FWD stock class had the most entrants and was very competitive! FWD stock class also hosted this rental Kia! It posted some very respectable 58 second runs and one 56 in the morning. 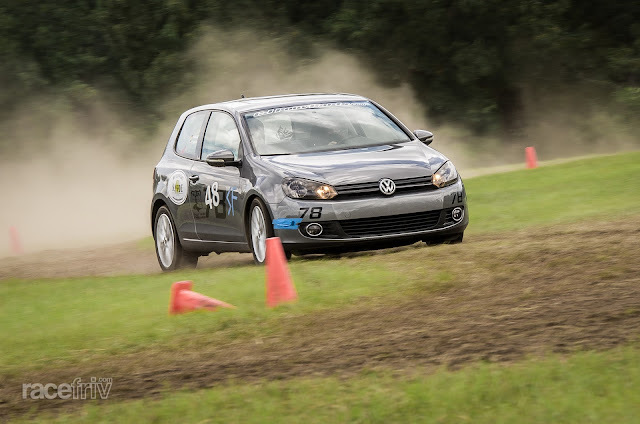 Jeff Parnell, Chris Ealer and Tim Ealer all shared this Golf TDi in FWD stock and proved that diesels could get the job done. They lapped in the mid 50s range in the morning. 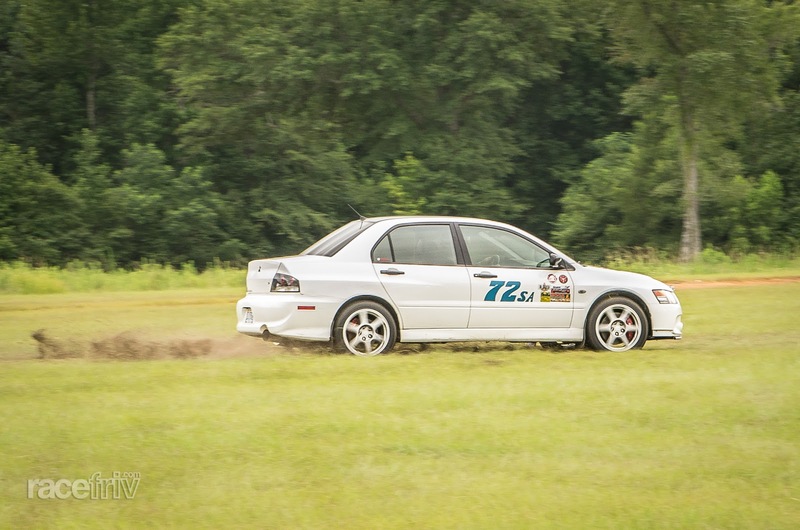 This 2006 EVO was the star of the Stock AWD class and posted the two fastest runs on the Morning track in the low 52s. He finished strong too posting fastest times on the afternoon layout but didn't quite take the overall win because his very first run of the day was quite a bit off the pace. 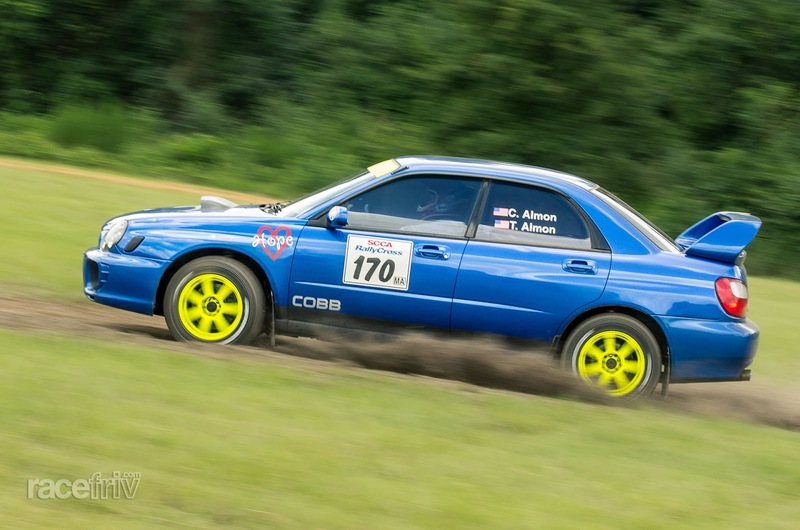 In Solo Rallycross every run counts and adds up to a grand total. One of the great things about an event like this is you get to meet a lot of new people and in this case it was good for me because I could talk about Subarus. One thing I didn't know about was the ABS fuse trick. 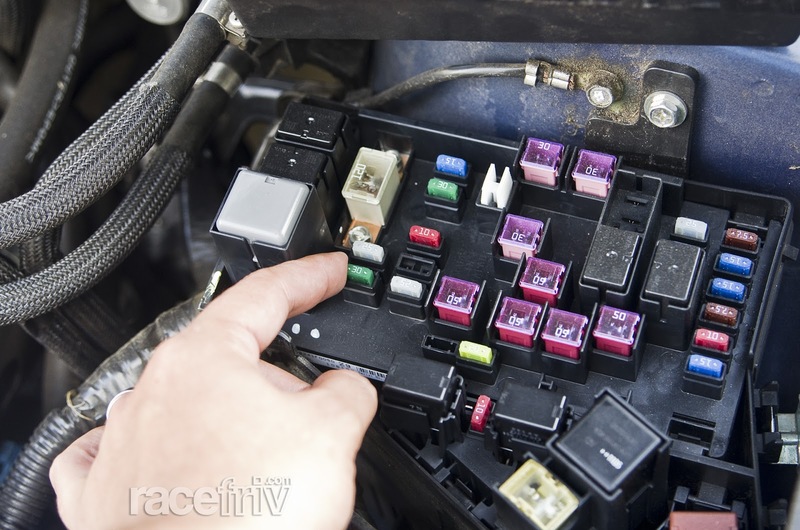 It made sense that pulling the ABS fuse would disable ABS braking but it turns out that it also disables the VDC (traction control) and hill assist systems. This makes life easier than always turning off traction control every time you start the car - I like to call it rally-mode. I'm tempted to make a remote switch to open this circuit from the drivers seat. If I had to sum the event up in simple terms rallycross is something everyone should do at least once. 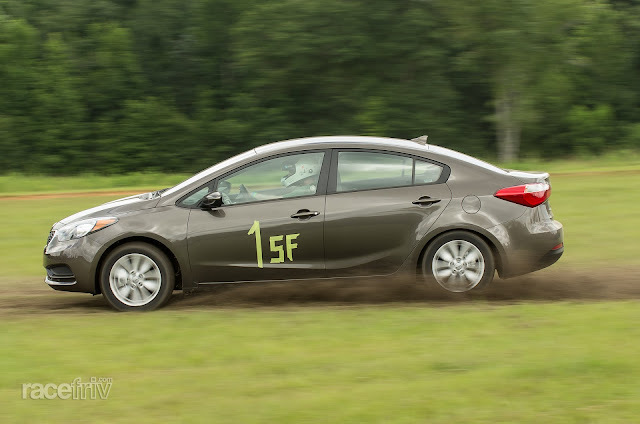 You don't need to worry how fast you go just enjoy the excuse to blast around a field through cones and slide the car around. Stay tuned to our Youtube channel to see a video we are putting together (better yet subscribe to the channel). And in the meantime stay frivolous! Woohoo! What a blast that was! Thanks for the ride, Phil.